The weather today was unpleasant. I love snow when I'm inside warm in my house with the gas heat turned up. However, today the weather was cold, windy and there was lots of sleet. I hate sleet. It's not rain, it's not snow, it's just miserable. I think I might also be a weather wimp. In the summer I begin to hate the heat in about July and I complain the rest of the summer. In the winter I complain that it is too cold and I am always wrapped up in three blankets. I seem to never be able to find the right heat to feel just comfortable. It would help if the area that we lived actually had 4 seasons every year. There are a lot of years when we are lucky if we have two seasons. I do love winter foods. There is something very comforting and relaxing about soups, stews and winter meat dishes. One of my favorite winter dishes is roasted chicken. There are so many ways to prepare it and a little change in flavor can make a huge difference. Last week I tried a new recipe for Roasted Chicken Thighs with Lemon and Oregano from the December issue of Bon Appetit magazine. This recipe has 11 ingredients. It takes a total of 30 minutes, 20 minutes of which is active and makes 4 servings. I have never seen boneless skin-on chicken at the store so I used bone-in skin-on thighs instead. Since my chicken had bones I increased the cooking time to 25 minutes in the oven instead of the 6-8 minutes in the recipe. I also doubled the recipe in order to have 8 large breasts so I had leftovers. Be very careful when taking the skillet out of the oven. I have had the misfortune of touching the handle of the skillet after taking it out of the oven one too many times. I suggest putting a pot holder or towel over the handle after taking the skillet out of the oven to prevent burns. I chose not to drizzle the oil over the chicken at the end of the recipe. The sauce was more than adequate to keep the chicken moist. I followed the remainder of the recipe as written. My family really liked this recipe. If you have never browned chicken on the stove before there are a few things to keep in mind. First don't use a non-stick pan. Non-stick pans are okay for many things, but roasted chicken isn't one of them. I use stainless steel pans and love them. Second, do not try flipping the chicken until it releases naturally from the pan. If you try flipping the chicken before it is fully browned the skin will break and you will not end up with that crispy browned skin that everyone loves. For this recipe I modified the step where the thighs were kept skin side down in the skillet once in the oven. I flipped them over to cook during their oven time in order to keep the crisp beautifully browned skin. For the recipe go to Roasted Chicken Thighs. Ahh! I love roasted chicken and I am ready to try this recipe, now. Thanks for the visit and follow over at Properhoney. Know you now have a new follower as well, and I am looking forward to trying some new recipes/food! Happy New Year. 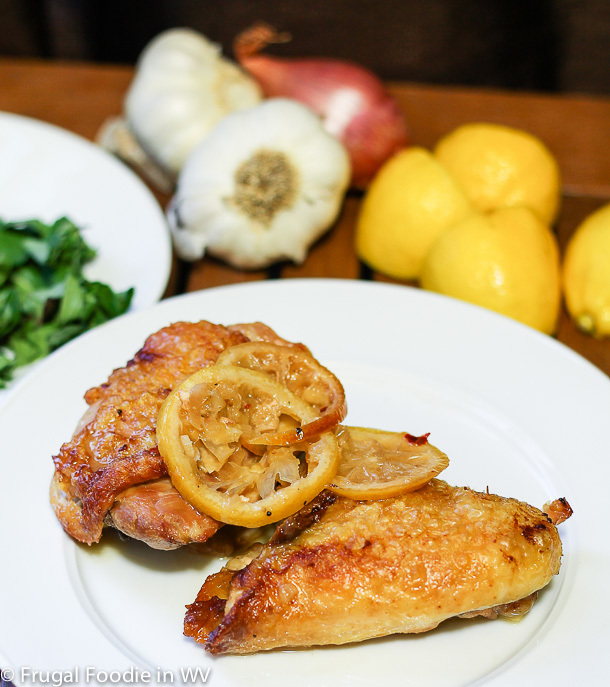 I love roasted chicken also :) If you end up trying any of the recipes on my site, tell me how they turn out! one of my favorite things!!! hopping over to say Aloha( from the hop) Hugs! I love roasted chicken also, it's yummy! These look lovely, I might just try them for our New Year's dinner instead of boring old turkey. If you end up trying it tell me how it turns out :) Thanks for the sweet comment too!